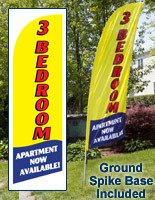 These Real Estate Flags Come with a Ground Stake! Brokers Can Place in the Front Yard of Homes or Apartments! 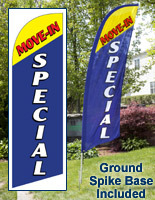 Real Estate Flags, Called Blade Banners, Come in Several Color Choices! Black nylon carrying bag for organized storage and convenient carrying. Aluminum and fiberglass pole breaks into four sections for portablity. 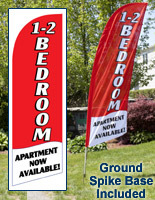 These real estate flags, also known as flutter banners, are specifically designed for advertising vacant 3-bedroom apartments! 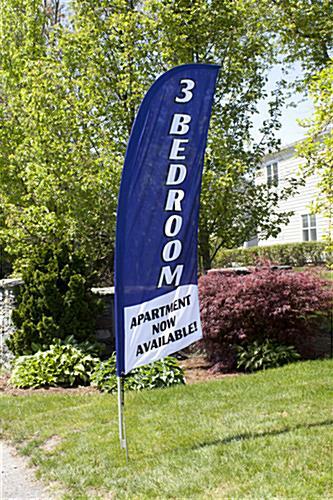 Large, vertically oriented text reads "3-BEDROOM" in bold white font on the blue background. "APARTMENT NOW AVAILABLE!" 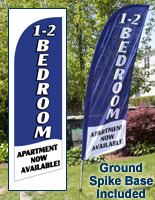 is printed on the blade banner real estate flags in horizontally oriented text in black font on a white background. The combination of the two messages ensures everyone driving by a complex knows there are units available for rent or lease. The real estate flags that advertise 3 bedroom apartments are ideal for agents listing availabilities in multi-family homes or for property managers with several units for rent. 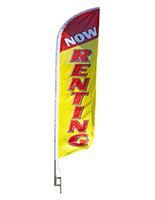 When mounted on the pole, the feather flag stands approximately 8' high for visibility from long distances. These outdoor displays are real estate flags that fill vacancies. The combination of 8' height, large font and high-contrast color scheme makes these blade banners far more effective than smaller size lawn signs. 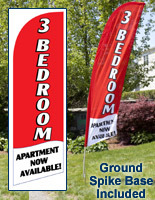 The real estate flags that are 8' tall have a polyester knitted fabric pennant. The polyknit fabric stretches over the curved pole in a manner that ensures the banner is fully expanded so the message is easy to read. 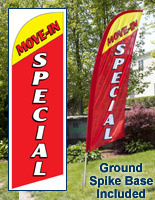 The real estate flags have a cord, which clips onto the pole to ensure the unit stays securely on the flagpole. Since the top two sections of the pole are fiberglass, they bow and flutter in the wind like similar displays with a 100% fiberglass construction. However, the fact aluminum and not fiberglass is used for the bottom two sections of the pole keeps the price points of these real estate flags low. 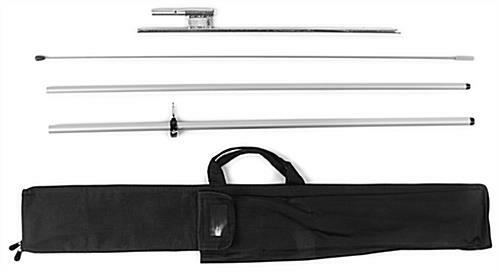 The poles break into four sections for storage in the black nylon carrying bag, which is included with purchase. 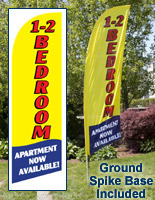 A ground spike is also included with these real estate flags for displaying the unit on lawns and grassy surfaces. Weighting only 4 lbs. with all the components inside, the bag is easy to carry indoors, and compact for extended storage once all vacancies have been filled.